Open your mouth and say whaaa? Kristina Holey seems nice enough when I visit her for a facial. The California facialist’s ethereal beauty and gentle kindness exudes warmth and calm. Once you’re on her treatment table, she jovially chides you for testing that fancy-schmancy moisturizer that’s packed with chemicals she doesn’t approve of, then explains why she wants you to ditch it for a DIY mix of matcha powder and Greek yogurt and you already know that you will comply. Then, just as you begin to slip into that special facial-drunk state after she cleanses your skin, you hear the snap of rubber gloves, and like Scooby Doo, your eyes pop open and you mumble, “Rrrr?” Too late; her fingers are already inside your mouth. What is she DOING? That’s not entirely fair. Holey does give her clients fair warning that her treatment will include a section where she massages their cheeks inside and out. Still, even with said warning, the whole experience is a bit jarring. This inner/outer massage is called the Buccal technique, and a growing number of aestheticians are practicing it. 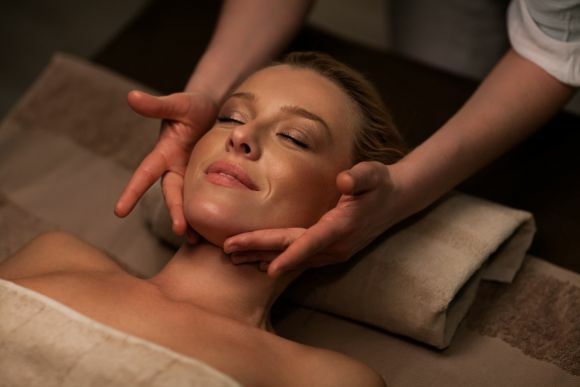 Believed to have originated in Paris (quelle surprise…) by famed aesthetician and skincare creator Joelle Ciocco, Buccal cheek and fascial massage is touted to bring about not only a glow to skin, but a relaxed and simultaneously more pronounced bone structure. “You know, there isn't really that much clinical research out there with results — I assume no one has invested the money into it — but more exciting info will be published in the next years,” she says, noting these claims about how the buccal technique affects the face are ones she has noticed from practicing it. Nichola Joss, who treats clients both in London and New York, learned the technique in Indonesia and has been practicing the method of 20 years. Holey, who’s been Buccal-ing since 2013, loves the treatment because of what she gleans from performing it. So, is it really relaxing? Well... Think of it like a Shiatsu massage. It hurts when you’re having it done, but you believe your face will benefit from it, so you just try to hang in there and endure it as the practitioner stays with you, gently promising just a few...more...seconds. When it’s done, one does feel a kind of release, and when the treatment is done — hello cheekbones! Who should not try it? Anyone with significant amounts of cystic or inflammatory acne, along with anyone who’s undergone a Threadlift treatment. “I’ve recently started encountering clients who have had that done, and I can’t even touch their faces with any pressure, it kills me!” complains Holey. “I just can’t risk breaking those threads!” She adds that those who have an injectable facial filler, a temporary treatment that adds volume to places like cheeks and lips, may not be candidates, as well. So if you have filler, talk to your provider about whether this facial is right for you. Holey, who studied under Ciocco remembers her Buccal treatment being quite intense. When I run this by New York dermatologist Dr. Neal Schultz, he says how he can see how this kind of vigorous massaging would add a bit of glow, but warns against certain kinds of movements. I’ve been Buccalled several times, and by four practitioners: Joss, Holey, L.A.’s Terri Lawton and Isabelle Bellis, a French New York ex-pat and another Ciocco alum. When Schultz asks what I think of the experiences, I offer up that Shiatsu comparison. When he asks if I saw a difference, I say yes. When he asks how long I’d noticed the difference, I admit that I’m not the best at self-documentation.